On 25th February 2017 Gyanoday Niketan hosted a workshop on handwriting which was conducted by �Write Right�, an Institution that offers solutions to any and every possible problem related to handwriting. Mr. Himangshu Singh was the resource person who conducted the workshop. 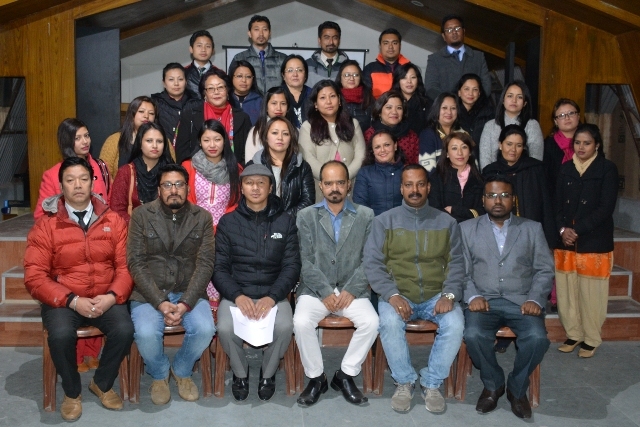 Altogether, 29 teachers from six schools participated in the two hours workshop. The workshop dealt with � 1. How to achieve good handwriting 2. Handwriting and its importance in present day scenario 3. Effects of poor handwriting 4. Adapting to correct writing methods. A brief overview of the workshop � Children start scribbling on the walls once they get a pencil or a crayon when they are about two to three years old. One can understand the emotional and mental state of a child from these scribblings. A child scribbling in circles denotes happiness and joy, while a child scribbling lines denote unhappiness and disturbed state of mind. As a child learns to write, a lot of strain is experienced in the hands and wrists, but while scribbling on the wall, no such strain is experienced. For a child the letter �A� is not a letter, but it is an object, as the child does not understand the concept of a letter. For a child, it is just a shape with lines. It is easier for a child to write the letter �L� as �L� is like drawing a line without lifting the hand whereas in writing the letter �A� a child needs to lift his/her hand three times. A good handwriting requires proper spacing between letters as well as words. There should be a gap of at least the tip of the pencil between two letters, as it will be legible whereas overlapping of letters produces illegible words and the space between two words should be the size of the letter �m�. Care should be taken while writing the letters like g, y and p as there is a probability of overlapping with the words written in the next line. Writing in four line sheets confuses a child as he/she has no idea about lines and hence it is better to train the child to write in a box as there will be no horizontal limit. All children are not right handed; there are a few who are left handed. The teacher needs to be careful as their motion while writing becomes inward motion, and the left handed children should always be seated to the left side of the wall of the classroom, while facing the classroom. Mr. Singh concluded the workshop on stressing that handwriting is a skill and with the correct method of practice, one can master the skill.